Ijji.com: The Future Of Casual Online Gaming? We’ve covered a variety of casual gaming sites before on TechCrunch. It’s a hot vertical, particular since the rise of the Nintendo’s Wii console proved that there was a huge willing market for games that don’t need a 4 hour long instruction session from a gaming geek. South Korean company NHN comes with strong credentials. The company is claimed to be the be “the leading internet company” in its home market and has a huge gaming presence in Japan and China, with the company claiming 170 million registered gamers in China. Its US arm NHN USA Inc launched the ijji.com gaming portal in 2006, and since this time its grown to high levels, with Alexa counting the site at 580, but notably 256th spot in the US (yes yes, Alexa cant be trusted etc.., but sites don’t get this high on Alexa without some traffic). Ijji.com offers a variety of games including traditional titles such as Poker and Chess, and then site specific games including a warfare game by the name of Soldier Front, a shooter called Gunz and a couple of other games. I’d read about their driving game “Drift City” on Something Awful this weekend so this was my starting point. Most people would presume that casual gaming would equate to quick to play, but with Drift City the word casual is someone’s idea of a joke. First up was the site telling me that I needed to be using IE 7 to play the game (no mention of Windows, but that’s a given), so I switched across to a virtual machine running Windows to get started. The next hurdle: a 700mb + download. 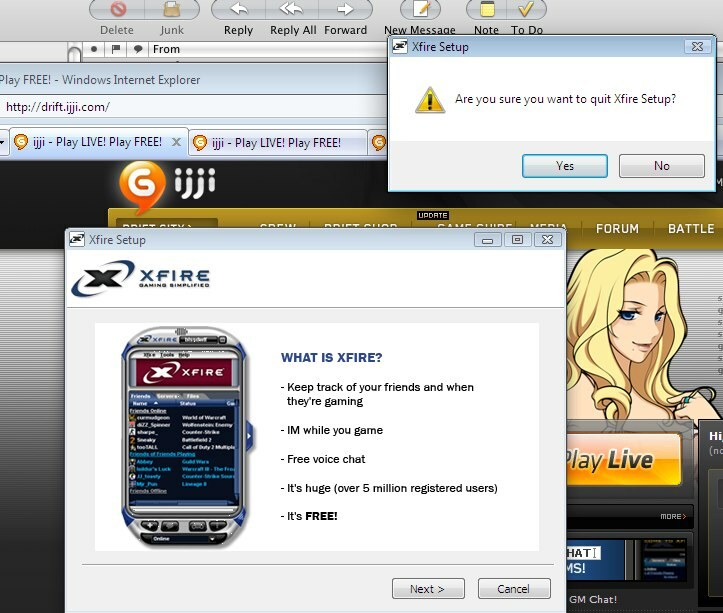 Why you need IE7 when the game runs on its own software is beyond me. Ijji.com also scrimps on a decent server to handle downloads; I may only have a 2mb cable connection but the 700mb took nearly 4 hours to download via a Windows installer program that gave no indication of download speeds or how long it would take. The only option on the download was to turn off P2P sharing, which warns you that if you turn it off your download will be slower, how wasn’t explained but it never takes me that long to download something off BitTorrent for example so perhaps others weren’t using this option. Then there is a number of screens during installation, and it attempts to install something called XFire, a gamers communication device that isn’t necessary for the game, I hit cancel on this one and finally got to the game itself. This is a free game so you wouldn’t expect top level graphics, and you don’t get them. It feels a little bit like the classic arcade game Outrun, which if you’re old enough to remember the game isn’t necessarily a bad thing. You start with a standard car which you can drive around a city scape which is apparently on some sort of mining focused island in the North Pacific (I tuned out during the intro screens). Like say Second Life or similar virtual worlds you can communicate with other members. Driving itself is as hard as using your arrow keys, and all cars are automatic so there’s no gear shifting. Control gives your car “boost” powered which as the name suggests makes the car go faster, and SHIFT allows you to drift around corners ala The Fast and the Furious 3: Tokyo Drift. Beginners are presented with tasks that involve driving to one point, picking up an item (by driving over the target area) then returning to base. 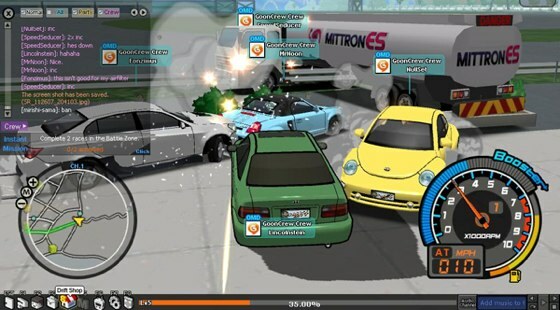 You do this in an environment which is rich with other users and computer controlled cars as well. Half the fun is driving into other users and things, although you lose “boost” power by doing so. After getting past a certain point, users can upgrade their cars, change colors and take on new tasks such as special deliveries, goals that earn you money for upgrades etc..
At this point you also have the ability to race other members. The social side of the game allows you to join with other members in teams and participate together. Races offer a variety of challenges other different courses. It took me soo long to actually get to the point of having Drift City running that I was prepared to rip shreds into the game and NHN for it, but having eventually got online and played Drift City for a while I actually enjoyed it. It’s not going to appeal to a generation raised on cutting edge computer gaming but for those a little older (and the installation process aside) it’s a bit of casual fun. Is it however the future of casual gaming? Ijji.com’s offering are a step above the true online casual gaming offered by startups such as Kongregate, but they’re got a much lower barrier to entry than say Second Life or Project Entropia. Many of the low graphics (mostly 2D) virtual worlds such as Club Penguin and Habbo Hotel target kids (and usually girls) where as Ijji.com has an older masculine target audience and offer games that don’t require an ongoing presence or commitment to succeed. If Alexa can be believed this isn’t the future of casual gaming, it’s the now of casual online gaming, and it will likely find a growing audience. The following video was put together by Something Awful (who rated the game -27), it doesn’t give the full gist of the game but like any Something Awful video it has its moments.